Only Paithani boutique curates and sells unique Paithani sarees and dupattas in vibrant hues and exclusive designs. Let’s get one thing clear, the saree is the most flattering piece of clothing a woman can wear. For those of you looking to shake things up in the saree department and want to add a new silk to your collection, your next buy should be the Maharashtrian Paithani silk. Paithani sarees are fine handwoven silk sarees in kaleidoscopic hues with a rich zari border, large peacock prints, and often both! Now that we’ve piqued your interest, head over to Only Paithanis because that’s their specialty (if the name didn’t give you a hint). 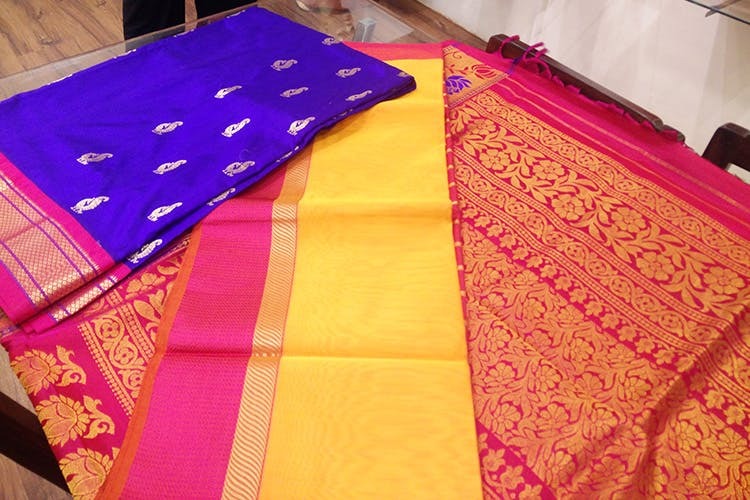 The outlet is Bangalore’s first saree boutique exclusively for Paithani silks. The sarees come in bright blues, reds, pinks, yellows, greens (yes they have pastels too) in contrasting combinations to really embody that peacock aesthetic. They are available as unique design pieces due to the craftsmanship involved in creating each one. The artisans creating the tapestry like sarees are based in Maharashtra, so you know you’re getting the real deal here. While their Paithani silk sarees are the hot sellers they have a great collection of light cotton Paithani sarees as well for more casual affairs. They also have a small collection of Chanderi sarees if that’s more your style. Prices for the silk sarees start at INR 6,000 and go up to around INR 30,000 for the bridal collection. Love the pattern and feel of the material but don’t particularly want to invest in a saree? Worry not, as they have a collection of stoles and Kurta pieces (for occasions that don’t quite need a saree, but need the sanskar) in store and online.